OKLAHOMA CITY (AP) The Oklahoma City Thunder appeared to be on their way to their lofty preseason expectations during an eight-game win streak. Then they hit another rough patch. Oklahoma City dropped its fourth straight game Sunday when Brook Lopez scored 20 points and Julius Randle added 19, leading the Los Angeles Lakers to a 108-104 victory. Thunder guard Russell Westbrook said the team won’t panic. Westbrook scored 36 points and Paul George had 26, but Oklahoma City struggled on defense again. The Thunder have dropped four of five since losing defensive stopper Andre Roberson to a season-ending left patellar tendon injury. Of particular concern, the Lakers made 13 3-pointers. Jordan Clarkson scored 18 points and Brandon Ingram added 16 for the Lakers, who have won six of eight. The Lakers had lost 11 straight in Oklahoma City. The Lakers carried an 82-79 lead into the fourth quarter. Westbrook checked back in with the Lakers leading 87-84 and just over eight minutes remaining. The Lakers went up 98-90 on a fast-break layup by Josh Hart. Ingram made a layup for the Lakers and George fouled him. George argued the call and was issued a technical foul with 3:32 left. Ingram and Clarkson each made a free throw to give Los Angeles a 10-point lead. A 3-pointer by George trimmed the Lakers’ lead to 107-104 with 24.7 seconds to play. Randle was fouled with 17.9 seconds left, and he made the first of two free throws. Westbrook missed a long 3-pointer, and the Lakers pulled down the rebound to escape. Lakers: G Lonzo Ball missed his 10th straight game with a sore left knee. … Walton was called for a technical foul late in the first quarter. … Lopez made 4 of 9 3-pointers. … Hart had 14 points and 11 rebounds. … F Kyle Kuzma, the team’s leading scorer, finished with two points in 16 minutes. Thunder: F Carmelo Anthony had six rebounds in the first quarter. He finished with 10 points and 13 rebounds. … Anthony and C Steven Adams were called for technicals in the third quarter. … Made just 7 of 25 3-pointers. 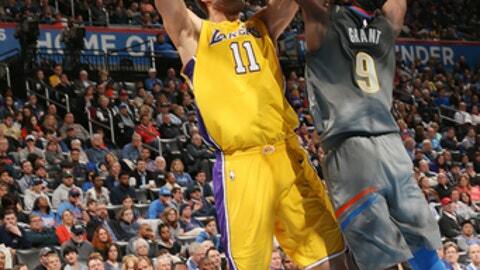 Oklahoma City outrebounded the Lakers 28-13 in the second half and still couldn’t make up ground. That’s because the Thunder allowed the Lakers to shoot 55 percent in the second half, including 50 percent from 3-point range. Lakers: Host Phoenix on Tuesday. Thunder: Play at Golden State on Tuesday.